Teachers, good, bad or indifferent, can never know where their influence ends. Many people teach for 40 or more years: my grandfather, who was 15 and thus a very junior teacher when he started his career, was a record breaker. After retiring at the age of 65, he became a part-time school librarian, and did not retire again until he was 70. It is obviously quite impossible to estimate how many young lives he influenced for better or for worse. My father, also a teacher, died at 89, and my brother and I were touched to see the number of former students who came to his funeral. I now have no idea how many students I've taught in two countries: I don't think I ever really tried to count them. I remember some, usually the high achievers and their troublesome and often troubled opposites, but most are unfortunately a blur: the human memory has its limits. But I think I can name all the teachers I ever had: this, of course, is much easier to do. And there was more evidence of this ease today. 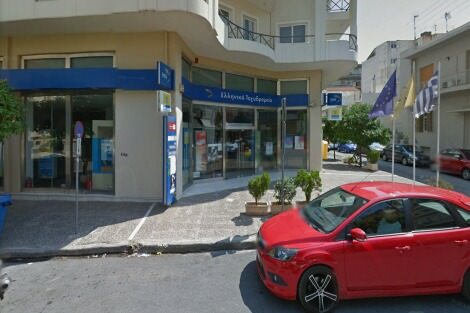 I was in the Kalamata post office, waiting my turn and clutching a fistful of cards and letters bound for Australia, when a bearded young man asked me a question of a practical nature. There was no point in pretending: I had no idea who he was, so I used the passage of time and his beard as excuses, and went on to ask his name. 'Andrew. Andreas,' he said, and in that moment I saw the boy he had been. A nice teenager he was way back then, and now he is a nice man. I wanted a brief summary of his life to date, and he obliged. He is now a lawyer, following in parental footsteps, and had spent some time studying in Essex. 'How was England?' I asked. He laughed and replied that life is quiet there (it always strikes Greeks that way), but that he had had only a 40 minute train ride to London, and that had been great. "He brightened again, and recalled classroom days. 'You were strict, but that did us good. We appreciated it.' Perhaps in the long run, I thought, but said nothing." But when I asked about work, Andreas' effervescence subsided. 'It's not going too well, to be frank,' he said. 'These are troubled times, and people are reluctant to consult lawyers because of the expense.' As I had once accompanied a friend to the Kalamata Court, and had decided that once was quite enough, I murmured about recourse to law involving a significant ordeal. He sighed then about too much tangled bureaucracy and not enough efficiency and organisation. And sighed again when I asked in true Greek style whether he was married. 'I don't think I can afford it,' he replied. He's probably right; in any case Greeks have never believed in the myth of two living as cheaply as one. He brightened again, and recalled classroom days. 'You were strict,' he announced, 'but that did us good. We appreciated it.' Perhaps in the long run, I thought, but said nothing. He then ensured that I had a better place in the queue and disappeared on his own business. A few minutes later he returned, and proffered a couple of stamps. 'These should do for Australia,' he said. 'I am very grateful to you, so please take them.' Of course I did, while feeling quite overcome by this spontaneous thoughtfulness. We said our goodbyes, exchanged wishes for a happy festive season, and parted. At this stage of life my mind resembles nothing so much as a layer-cake composed of fragments of text, and so I recalled the Wordsworth quotation first taught me by my father: it concerns that best portion of a good man's life: his little, nameless, unremembered acts of kindness and of love. But I will not soon forget Andreas' act of kindness, one that made me feel, even after all these years, that my efforts had been valued. I had received, all unexpectedly, a charming Christmas present. Beautiful Gillian. I think also of all those dreams and hopes that young people have and how life may have treated them. I hope this young man finds work. I pray for the Greeks and their hard times. You are still teaching ; I feel I have learnt much with your words sitting here at the kitchen table this afternoon. It's funny how things work out. My weakest subject at school was mathematics and I married a teacher of other mathematicians. Very fortunate that. But a teacher I'll always remember taught me about creative writing. He taught me to find ways of tapping into my own emotions, appropriately enough as he was a serious sort of person. Thanks for your wonderful writing this year Gillian! What a lovely vignette, nothing spectacular just full of plain common empathy and sensitivity. You shared your Christmas present many times over. Dear Gillian, You will never know how far your teaching days have affected your pupils. I am grateful for the nuns who taught me and still remember them with fondness (I am 80). Sometimes we learn from teacher's behaviour, not necessarily just what they are teaching us curriculum wise. I have two teacher children and now a lovely g/daughter has just qualified In HSC to become a Primary School Teacher. Long live teachers! I say, and bless you. I taught at Hallam High for 14 years. You may have been a student there as your father was the Principal to develop the school from scratch. Your father was succeeded by Ken Adams who transferred to Doveton High as Principal and was succeeded by Ian Chisolm at Hallam. I spent 14 years at both schools and loved them immensely. I lived in Doveton and later Dandenong, so I enjoyed meeting many students out of class as well as in it. I never met your father but his name was often mentioned with considerable respect. Since your father's day the Hallam, Doveton, Endeavour Hills and Fountain Gate communities attempted to build 3 &-10 ncampuses and one 11-12 campus with a total of 3000 students. This experiment was abandoned after a decade or so, with its strengths and its weaknesses and there are now stand alone 7-12 colleges. Personally, I enjoyed working in both systems for 28 years and applaud those who set up and those who continued to improve education in those areas. Thanks for a touching article Gillian. Indeed you did receive a lovely Christmas present; one that silverfish and rust cannot destroy, and one that requires no storage space. Many thanks for all those kind comments. I was touched by the reference to my father, Keith. I didn't attend that school, but certainly knew the colleagues you mention. What an amazing article; what is more amazing is that I know that chatty young man Andreas who would be kind and respectful to a teacher he never forgot. We always remember the teachers who left a foot print in our backside to make us look at life seriously. Also the very bad once whose only interest was their pay packet at the end of the month. Teachers who were strict but worked for the good of their students left an impression and influence our lives for ever.